Mozart's light-hearted masterpiece Die Zauberflöte (The Magic Flute), performed in German on 3–4 May 2006, was Opera Gold's most ambitious production to date. Previous productions had been in the intimate venue of Deptford Town Hall with a handful of musicians; this however was a full-size staging in Goldsmiths Great Hall, with a chamber orchestra. 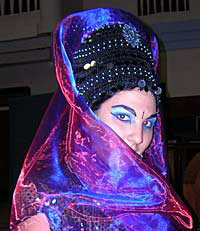 The principals included Jessica Lobbett as the Queen of the Night (picture).